Detox symptoms are no joke. At some point everyday I have a period of time where I feel like I have the flu… my usual daily headaches worsened and moved to a new spot on my head… wheezing at random times (I’m asthmatic), continued night sweats, and even more fatigue. Plus, my skin feels gross and is covered in bumps… so why the heck am I still following this raw fruitarian diet? Because detox is GOOD! Experiencing a “healing crisis” doesn’t mean the diet is harming me, rather, it means the diet is helping me. Detox leads to healing and sometimes, it’s necessary to experience times of pain leading up to the great prize. Detox is a cleansing process in which the body rids itself of toxic buildup in an effort to heal. Our bodies must “clean house” by throwing away the accumulated toxins raiding our cells from unhealthy diets, environmental exposure to chemicals, air pollution, medications, injury, disease, etc. A “healing crisis” is a natural response that occurs when our organs are working to eliminate waste in an effort to heal the body; during this time of crisis symptoms of illness will arise. Think about the damage we have all caused our bodies, the amount of toxic crud, abuse, and unhealthy choices… it’s a HUGE task to clean out those toxins and it will be met with repercussions. When a drug addict stops taking drugs, detox has to occur to clean out the body of the drug. And detox makes addicts sick… how can we expect detox from food to not cause the same reaction? I expect my detox to be long lasting considering the amount of disease in my body, the years of harmful prescription drugs, laxative abuse, long-term antibiotic use, major surgeries & multiple procedures ALL requiring anesthesia, hospitalizations, non-existent digestion, plus all the food/chemicals/damage cause in my 20 healthy years of life. I also expect this detox to come in waves as healing occurs on deeper and deeper levels. My prediction is that once I get past this first initial bout of detox (maybe a few more weeks or a couple months) that I will feel amazing for a while, before entering another healing crisis. In the week since I shared my first post about this raw fruitarian journey, I’ve continued learning more and more. Shoutout to my new friend from across the world, Petra, for sending me a plethora of vital/free information to help me in this journey. I’m amazed that my little blog is reaching anyone, let alone people across the world, and quite thankful that God spreads these messages in such cool ways. Petra has been on her own raw food healing journey for over a year and her wisdom/advice is much needed by a newbie like myself. The internet is an incredible tool for connection. It helps me to feel a little less alone. Thank you, Petra for caring about me!! counterpart glucose uses. Diffusion saves energy for the body and cells. simply pulled or absorbed through the cell wall by diffusion. blood, which then creates more insulin demand. Raw fruits and vegetables are always your best sources of simple sugars. blood sugars.” (The Detox Miracle Sourcebook by Dr. Robert Morse. To summarize: fructose requires NO insulin to be broken down and absorbed. Fructose = the simple sugar in fruit. More on that, here. Onto the next update… my new experiences with ELMO or Eat Less More Often. ELMO is an eating strategy I learned through the Wellness Forum which encourages people to eat small meals, more frequently, rather than 2-3 giant meals which can be very hard on digestion. The perfect travel fast food: Orange “tacos”. Fresh orange slices wrapped in a romaine leaf. I’ve wanted to do this for a long time. And I’ve tried so many times… every time met with severe pain, nausea, and vomiting no matter what I was eating. Because I’ve had my pancreas removed I HAVE to take pancreatic enzymes in order to have a chance at breaking down food. These enzymes have some unpleasant side effects and are very tricky to take. It requires constant trial and error and careful listening to your body to determine the appropriate number of pills to be taken every time you eat or drink something that is not a clear liquid. Therefore, you will never see me only take a taste or a few bites of something– it would be impossible to correctly take my enzymes with that! I wish I could eat a few pieces of fruit every hour or so but that simply does not work. Typically, I must fast for 12-16 hours a time before trying to eat on a new day. Eating times during the day must be spaced out 4-6 hours… snacking never works. However, it has been extra hard to keep my energy levels steady and to feel any kind of life force moving through me when I have to eat this way. On Saturday I told my husband I was going to try ELMO again as I found myself becoming extra weak and fatigued. Rather than eating at 3 points in the day, I’m now doing 4-5 with smaller quantities of food (still fasting 12-16 hours before I first eat). It has actually been going okay– WAY better than expected. I’m still figuring out my new enzyme dosages and my digestive system is working to adjust. Unfortunately I’ve had to rely on a few natural laxatives again but I am doing the absolute best I can and I won’t be discouraged by that. Finally, I want to boast about my frequent urination, Yes, I’m excited about my pee! When you eat a diet SUPER HIGH in water, living water from the raw living plants, it almost becomes unnecessary to drink very much. Upon waking up I always drink at least 30 ounces of water. But other than that…I don’t have to intentionally drink water, I only drink if I notice myself feeling thirsty or after walking outside/sweating. Why am I doing this? Because I am peeing every single hour of the waking day (and at least once at night), large amounts, or perfectly clear fluid! Signs that I am HYDRATED, a feeling I haven’t truly known for nearly four years. No, this is not excessive urination it is proper urination. A great hydration test, recommended by the world-renown Dr. Michael Gregor, is to drink 3 cups of water on an empty bladder in the morning. If you pee out one cup worth of fluid within an hour, you were already hydrated. Your body was able to get rid of a large amount because your “tank” was already full. If you find yourself rarely needing to pee and if your pee has any color to it other than clear or very pale yellow, you are DEHYDRATED. We should not be able to go an entire work day without urinating… I know, certain careers don’t allow for bathroom breaks, but I beg you to find some way to fit that in. Literally, your life may depend on it. A great way to become more hydrated is to eat LIVING RAW FOODS which are overflowing with water in the purest form. Think about the water in an orange; it is totally protected by the outer peeling and therefore in its most natural, nutrient dense state when you eat that juicy fruit. This is true of all raw foods. Cooked food is MISSING water which makes digestion strenuous and dehydrates our cells not only by sucking the water out of them but also from all the added salt that comes with eating any type of cooked and processed food. It feels wonderful to effortlessly urinate and finally get that feeling of fully eliminating my bladder each time I go. And it’s even better that I’m getting ample hydration every time I eat. Finally, we attended a wedding last weekend (our 4th wedding since April! 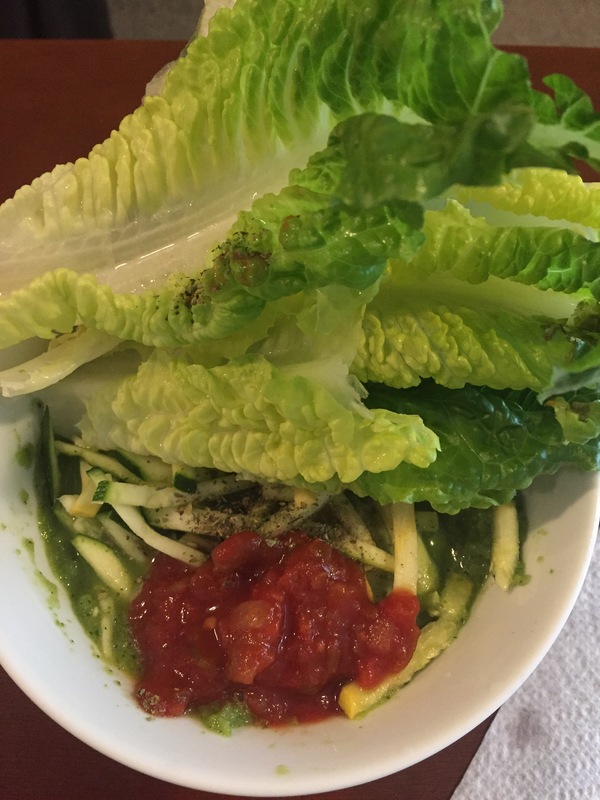 We have 10 in 2017 alone) and I decided to make “romaine chips and cucumber dressing.” It isn’t the most beautiful meal but it was satisfying, nourishing, and easy to pack in my purse. I made a dip/soup out of fresh tomato, bell pepper, cucumber, lime juice, and nutritional yeast. 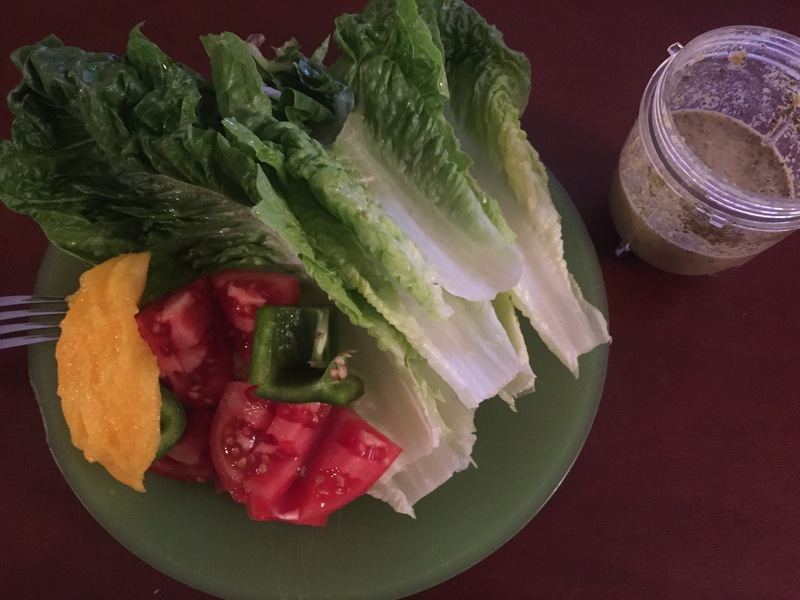 I simply pureed the ingredients in the blender, poured it into a bowl, and washed fresh romaine to use as a chip/vehicle to scoop the yummy dressing. At the wedding I felt proud to be eating something crunchy, fresh, and totally healing. Even with friends it’s always a bit awkward to bring out my own, unique food while everyone else shares the same meal. It’s not even that I want whatever meal is served (although I appreciate the great smells) it is simply hard to always be different. Sometimes anxiety creeps in as I slowly pull my meal out of my purse… I know others are wondering what the heck I have… I feel like people are watching me and thinking I’m weird. They probably aren’t. And if they are, oh well! Part of me loves being different and another part of me just wants to feel like everyone else because I do feel alone in my unique body, all the time. I think that pretty much sums up another week of my raw fruitarian diet journey for healing complicated disease. Thank you so much for reading, sharing, and encouraging me on this journey! I received an incredible email which completely renewed my spirit AND after reviewing the stats on my last post I was blown away by the news that Still Waters was viewed in 32 COUNTRIES across the globe. Woah! Humbled, thankful, unbelievable. I’m already excited to share more with you next week! Interested in more? Check out the Still Waters Blog Podcast on itunes and Google play or give my a follow on social media: Instagram — @stillwatersblog // Facebook — Still Waters Blog. Really Mallory? You’re asthmatic? That’s very interesting to me … You can read all about it in my email message to you. Detox is a very good thing! You’re perfectly right. My detox was heavy. At some point I even thought ‘the diet was no good for me’. There were times I thought something was shifting on the inside and I was going to faint. I had flu symptoms too (but hurray, bacause I n e v e r had the flu and having a good flu once in a while is good: your immune system is working! But mine seemed dead. But not on 80 10 10!). I was tired too. Very, very tired. And thirsty. But after 3 months … I had energy! No more stiffness – I’ll be 60 next april – and my mood improved dramatically. Social situations are difficult, especially in the beginning, but after a while it gets more normal. I’m sure you’re on the right track Mallory! Keep going! And if the detox symptoms get way too heavy some day, take some coocked carrots or other vegetables or soup in the evening. In my case, it stopped the detox immediately. I felt fine the next day, but I realized: the detox symptoms have stopped! So I would start 80 10 10 again.